5 brownie points as to why wear ethnic suit over saree for a friend’s wedding? When you opt for wearing a suit, you actually lay your hands on variety of both classic and contemporary styles to choose from. You may pick up the most unique saree, but would end up looking the same, without much variation. But in suits you get ample of variations in the form of long anarkali or gown style suits, patiala with short suit, Indo-Western draped style pant suit, Pakistani style etc. Suits are very easy to be worn and extremely easy to be carried while dancing or roaming around in those high heels. You can simply be comfortable all the night long and do not have to deal with the deadening fear of falling down due to your saree pleats coming under your own feet. Unlike when you opt to wear a saree, you don’t have to worry much about which type of jewellery will go perfectly with your suit! A sober pair of statement earrings like jhumkis, chaand baalis or casual chunky danglers will look excellent! If you want a room for wearing less makeup, then going for a suit is all that you need, as bare minimal makeup is required to be applied. Unlike sarees that require good amount of facial and eye makeup; wearing a suit cuts down this need to simple application of a stroke of kajal and lip gloss and be party ready. Till the time pheras start taking place, you are totally exhausted carrying a sareee that you very occasionally drape! This leaves you with none other option than changing your outfit along with the hassle of changing your accessories and makeup. You can simply stay away from all these pains by wearing a comfortable suit in which you can very easily walk, roam, sit, sleep and spend your entire day. If you are looking for a store to buy girls and women churidars suitsonline then Indiarush is the perfect destination for your search. 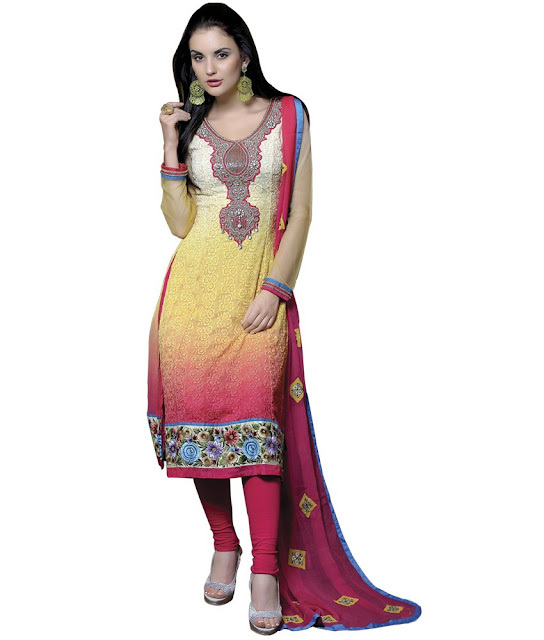 It has the best collection of online salwar suits for girls!